This is what it might look like – the Porsche of tomorrow. Together with the new 911 Carrera, Porsche is presenting the Mission E concept car at the IAA in Frankfurt from 17 to 27 September. The concept car is a coherent design of a sports car with an electric drive and all of the traits that make up a Porsche. In the Mission E, an entirely new spread is experienced between performance and efficiency – supplemented by a futuristic display and control concept. The joint premiere with the new generation 911 Carrera has symbolic character. The first all-electrically powered four-seat Porsche of the 21st century represents the future of a concept that made the 911 the most successful sports car ever for over 50 years. The 911 Carrera and Mission E share one clear statement, namely that excellent sporty performance can be combined with maximum efficiency – the traditional Porsche values. In the new generation of the classic 911 Carrera sports car, innovative turbocharged engines stand for these values. The message of the concept car is E performance. This means that even an electrically powered Porsche naturally fulfils all requirements related to performance, range and driving dynamics. The Mission E concept car shows how Porsche envisions the future of the electric sports car. The fascinating design of the four-door car with four seats bears many references to the 911 while revealing the Mission E to be a Porsche at first glance. The passionately designed sports car with all-wheel drive develops a total power of over 600 hp, which can be converted into typical Porsche driving dynamics. 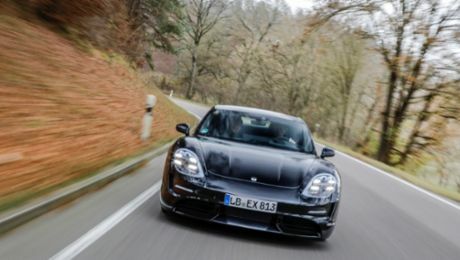 The driving range of the Mission E is over 500 kilometres, and the innovative 800-volts battery charging system Porsche Turbo Charging reduces charging time to just slightly longer than it takes to fill a car's fuel tank today. At the quick charge station, it takes just over fifteen minutes to provide enough charge for around 80 per cent of the total range. In keeping with the car's purist interior, the control and display concept is intuitive with eye-tracking and gesture control as well as innovative functions. The new generation 911 Carrera makes its debut at the IAA with new turbocharged engines, optimised chassis and the entirely new Porsche Communication Management system with online navigation. The turbocharged three-litre flat engine in the 911 Carrera has a power output of 272 kW (370 hp). In the 911 Carrera S it even generates 309 kW (420 hp), thanks to such features as modified turbochargers. Also excellent is the significant increase in torque together with an improvement of just around 12 per cent in fuel economy. The 911 Carrera has a maximum torque of 450 Nm and the 911 Carrera S even has 500 Nm. This torque is available from a low 1,700 rpm over practically the entire engine speed range. At the same time, the new engines with their maximum speed of 7,500 rpm are very free-revving and passionate.